I think one of the most perfect things about baseball is the way it mirrors the seasons. Hope springs eternal in the springtime! The time for digging up the old flower bed, tending some returning plants, putting a few new seeds in the ground. A little water, a little sunlight, a little weeding, a little hope. The energy is fresh and it’s so wonderful to be outside working up the soil. What emerges? Fresh arugula or a young Mike Trout in the outfield, depending on which garden you’re tending. But, 162 games is a long, long, long growing season. And, so now here we are in the fall. So tired. So tired of weeding. So tired of tending. So tired of zucchini. Everything is getting old and leggy and limp. And, we’re trying to coax just one more week – just one more win – out of that tired tomato plant with the worn out shoulder-vine. Mostly, though, you’re just trying to squeak out the last bit of life from a worn-out garden. You’re sort of getting tired of watching the garden, but you still want to savor every last minute you have left with it. You keep cutting back the basil because where will you be in December when it’s only a distant memory? You’ll be wishing for that basil plant, that’s where. So you cheer on that basil plant, and you clip those seed heads and you remind it that it’s only one game back of the Yankees. I’m still working on how the World Series fits into the garden. To be honest, as an Orioles’ fan, it’s been years since I’ve had to think about how one extends a season into October. Maybe the World Series is a giant pumpkin that’s been hiding in the weeds, only to “pop” out all orange and huge and brilliant when the knee-high weeds finally die back on their own. It’s the culmination of a long, long season … and a lot of hard work by a pumpkin that started out as a hopeful seed just a few months ago. And then, next thing you know, it will be cold and dark and the garden will grow quiet. As winter comes, you swear that was the last time you’ll spend every free moment in the garden. You swear that you’ll never put in such a big garden again. You swear that it’s too much work and you’re done with gardening. Forever. But, then after a little well-deserved little rest, the seed catalogs start showing up in the mail. And, then on one very dreary, snowy day, when you’re missing the basil, just like I told you would happen, you pick up a catalog and start dreaming of your spring garden … and then you wonder how the boys did in the off-season, and you start counting the days until pitchers and catchers report. But, it’s not quite winter yet. So, for today … with just 10 games left, I’m cutting back the basil and cheering for the Orioles and the jalapeño peppers, both of which seem to be particularly hot and sassy this year. And, hoping for a pumpkin. 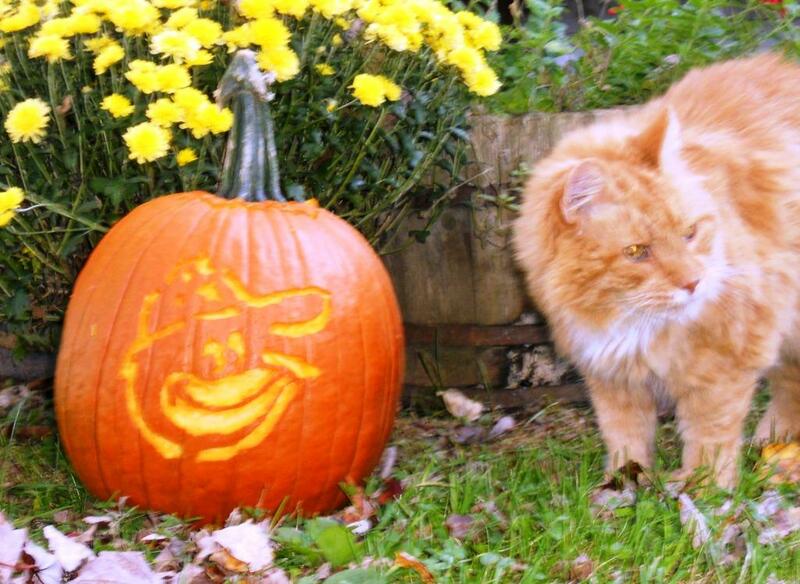 Want to carve your own Oriole Pumpkin? Click here for the stencil. This blurry photo is from 2011. To give the Baltimore Orioles’ bird something to do in October, I attempted to carve my very first pumpkin. If the Orioles go to the post-season this year, I will carve a much finer Oriole pumpkin. Oscar the cat, by the way, is 20. He was 5 when the Orioles last made it into the post-season. This entry was posted in Baltimore Orioles, Baseball and tagged Post-Season by Jackie, The Baseball Bloggess. Bookmark the permalink. Love the analogy! Perhaps there’s also some relationship between putting players on t-shirts or trading cards and making pickles or jams from the fruits of our gardens. They both serve to bring back memories of pleasurable things and can be taken out and enjoyed when the season is long, long gone. That’s perfect! I wonder if trading Adrian Gonzalez from the Red Sox to the Dodgers is like selling your squash at the Farmers’ Market? :) Thank you for reading and for the nice feedback!